PHOTOS: Wives of Nigerian comedians; who is the cutest? Even with their funny faces and acts, no one will believe a gorgeous woman would say yes to them. Comedians are special acts in the entertainment industry; they make people laugh in different ways apart from saying jokes on stage. Nigerian comedians sure have a great taste for women as among all the entertainers in Nigeria, they tend to have the most beautiful wives. No matter how they look, they have less of scandals. At any event, they show off their wives on the red carpet. Comedians and their wives are very quiet about their martial affairs in the news. Here are few top comedians and their wives. Who do you think has the cutest wife of them all? Bovi is a top comedian in Nigeria who has done well for himself since moving from acting in soaps to full comedy. He is married to a beautiful wife called Christabel. Both of them got married some years ago and now have two kids together and from the look of things, they are both enjoying their union as husband and wife. The comedian’s wife is regarded as one of the prettiest wives of Nigerian comedians. AY has become a big brand in the comedy industry since he came into the industry with his creative brand style. He got married to his beautiful wife, Mabel on the 28th of November, 2008. The comedian revealed that one of the reasons he married the woman he calls his wife was because of her fine legs. They both have a lovely daughter together named Michelle. Ali Baba, who is regarded as the godfather of Nigerian comedians, has been with his wife for 16 years and they have five children together; three girls and a set of twin boys. He is one man that loves his wife so much that he won’t accept anyone insult her, just as he blasted a fan who was trying to woo her on twitter some days ago, when he used her as his profile picture. Klint Da Drunk is one unique act in the comedy industry that has differentiated himself from the regular way comedians act on stage; his drunk act on stage has made him unique. He got married to his better half, Lilen in the year 2007, and according to the comedian, she has stood by him despite his shortcomings. Their marriage is blessed with two kids. Seyilaw has really made a name for himself since he came into the industry. 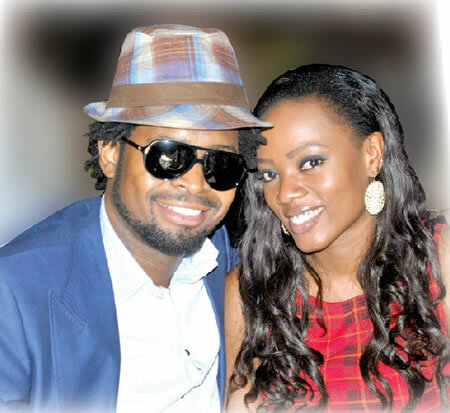 He married his pretty Igbo wife, Ebere Cham in a colorful ceremony on the 28th of March, 2012. They recently celebrated their three years anniversary in a romantic way. Hilarious comedian, Julius Agwu, who has maintained his comedy act for years now, got married to his beautiful wife, Ibiere in 2008, and are blessed with two kids. They seem really happy together. Comedian, ‘I Go Dye’, is one of the biggest names in the comedy industry and is married to a very pretty wife. The two are always seen together and he showers her with love everywhere they go together. They got married some years ago and are blessed with a son. Basketmouth, one of the biggest and successful comedians in the industry today, is making it bigger for himself. He got married to his pretty wife, who he has been dating seven years before marrying her on the 6th of November, 2010. They are blessed with two beautiful kids. PHOTOS: Wives of Nigerian comedians; who is the cutest? 0 out of 5 based on 0 ratings. 0 user reviews.